Here are the facts: Interstate 81’s bridges are nearing the end of their useful life. 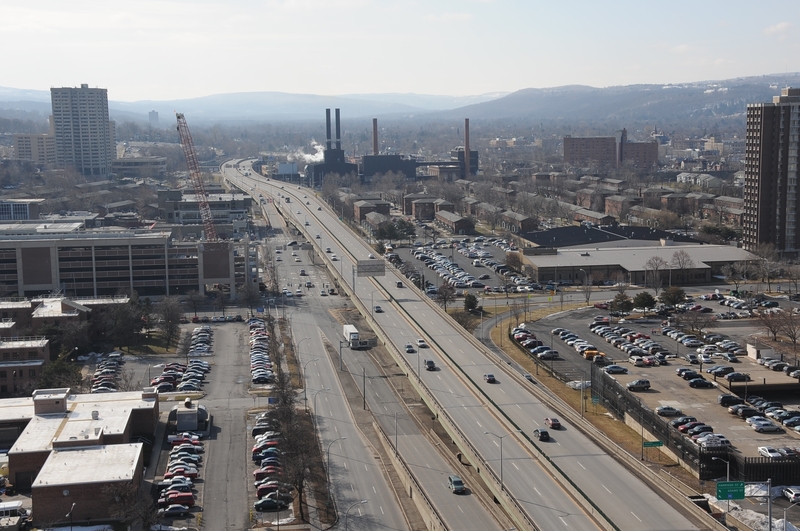 The elevated freeway cutting through the city of Syracuse suffers from structural deterioration that will require the bridges to be replaced, not just repaired, within the next several years. The project, whatever it looks like, will require huge amounts of public funds, and a permanent reconfiguration of at least some current traffic routes. Even if the viaduct through Syracuse is rebuilt, the on-ramps and off-ramps, which do not meet today’s highway standards, will not necessarily be replicated. The NYS Department of Transportation has embarked on the first phase of a review of the physical condition of the Interstate and a review of the related social, economic and environmental issues. State DOT has contracted with the Syracuse Metropolitan Transportation Council, a quasi-governmental group that oversees the regional transportation planning process, to lead a public input project on the I-81 concerns in Onondaga County and north to Central Square. Each of those studies will take up to two years. SMTC will also do transportation modeling, looking at the effects of various scenarios on traffic patterns. The Onondaga Citizens League has begun its own exploration, “Rethinking I-81”, intended to help citizens think creatively about feasible alternatives to rebuilding the City’s I-81 viaduct and corridor through Syracuse. We will begin by looking at what other cities have done in similar situations and examining alternative transportation plans for Syracuse. In a way this “futuring” exercise requires us to think creatively about what our world will look like 50 years from now, and how we would like to live and work. The way we live today is radically different than the world of 50 years ago, when the highway was designed. To some extent, the highway system has shaped our way of life. As a community, we should ensure that a project with the potential to transform us also leads us to the place we’d like to become, not just wherever the road takes us. Hopefully, “Rethinking I-81” – the study and this blog – will start the conversation rolling. This entry was posted in Introduction and tagged I-81, OCL Study, Syracuse on June 23, 2008 by OCL.